Piuma to Top of Stunt – If you look at the ridge you are about to climb you would never guess that a road goes up there. 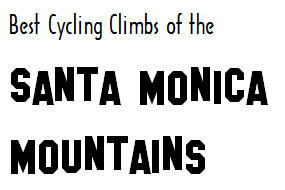 This area of the Santa Monica’s has the steepest and sheerest faces anywhere in the range. At just over 8 miles it sure can give you one heck of a workout. 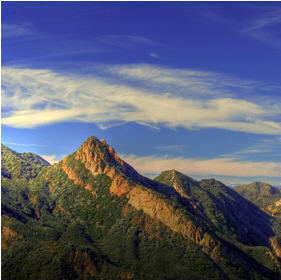 Great views down into Malibu Canyon and over towards Malibu Creek State Park where some of the most rugged of the Santa Monica Mountains lie. Constant changes in grade. It starts off pretty dam hard from about a quarter mile off of Las Virgines until you pass Cold Creek Canyon Rd. When you have just about had it the grade eases up quite a bit and you get to do some fun switchbacks and start enjoying the views. After the big U-turn at the west end of the road it kicks back up to a pretty wicked grade. Once again when you think you might have had it the road eases up and you can really hammer over the top. 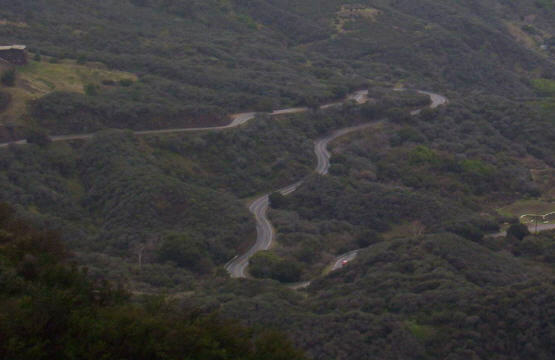 It has very cool winding switchbacks that give you fantastic views to the west and north and to the road below you. 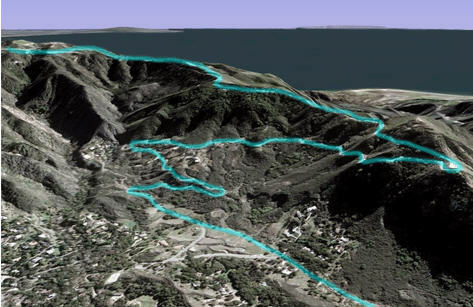 You also get great glimpses at a section of the backbone trail that I would never ever take my MTB on. Even when it is really windy most of the initial climb, at least up to the ridge, is generally very sheltered. After getting to the top of Piuma proper you get a great view of the Pacific Ocean and on clear days, Santa Monica and LA. That coupled with a really fun short decent to Schueren Road makes this section a welcome change before your last climb up to Stunt. Schueren Road up to Stunt is a great climb all on its own and you pass some very interesting rocks that are not found anywhere else in the Santa Monica’s. Though it does start relatively steep it eases off for the last ½ mile and makes for great showdowns with your riding partners as you blow whatever reserve energy you have left. Very good road conditions with smooth pavement on just about all of it. A bit nasty to get to if you are using Las Virgines to access it. Las Virgines is just not fun to bike on. Start off Cold Creek and you avoid this nasty bit and the first steep bit of Piuma. The left turn onto Schueren Road is a wicked one. Off camber and often dirty, it has broken more than its fair share of collarbones. Take it easy on that one.